Ight so there are a lot of times where I get really bored with the game because by the end of each month I’m kicking every bots face in to get more chips in this seemingly endless r&g. I think about going on a long hiatus then all of a sudden I get hit with some godly level of luck and I get motivated again. This genuinely made my day. I could not figure out how I got so lucky. 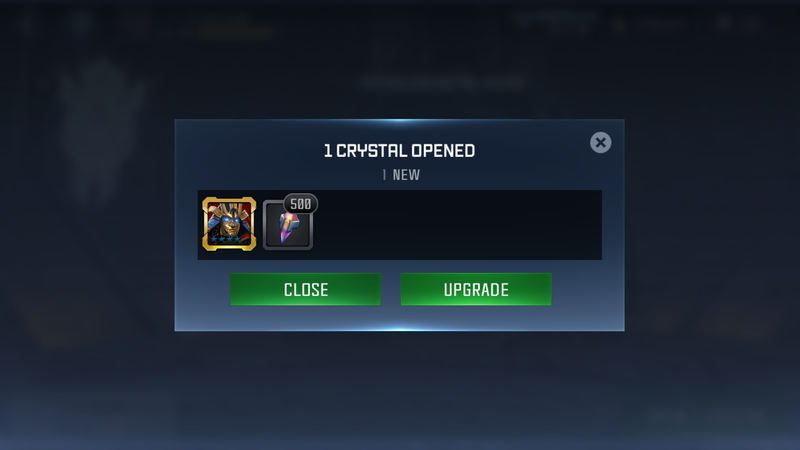 So the point to this is no matter how angry you get at this r&g gamble-fest that is this game’s crystals, you will always get a pull every now and then that will make your day. So don’t just give up and let bad luck get the better of you. 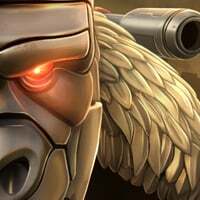 You forged 32 bots to get 1000 more 5* shards? But congrats for getting the bot you wish. 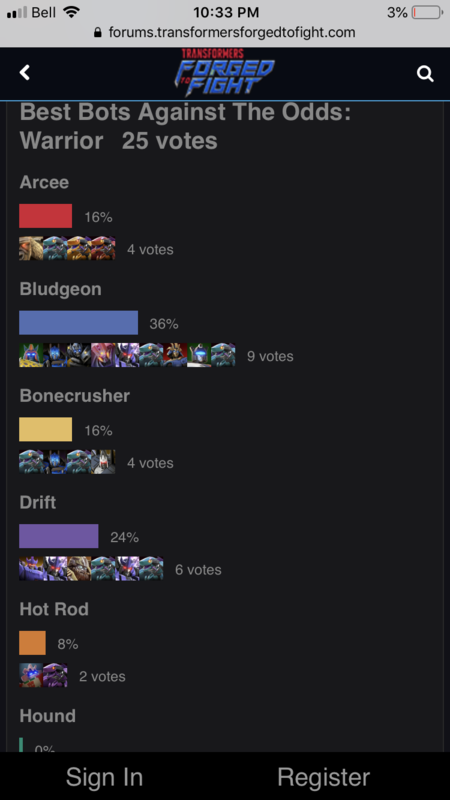 According to Kabam's usage data, Hot Rod is a certified "no-need-to-buff" bot. So he must be strong at the right hands. @FulMetalGrimlok could you please help me? I only have 1 5* warrier. I did lots of research, nobody ever ever put hot rod in a decent spot, nobody ever said he is even a half decent worrier. I want to rank him up but I am very hesitant. 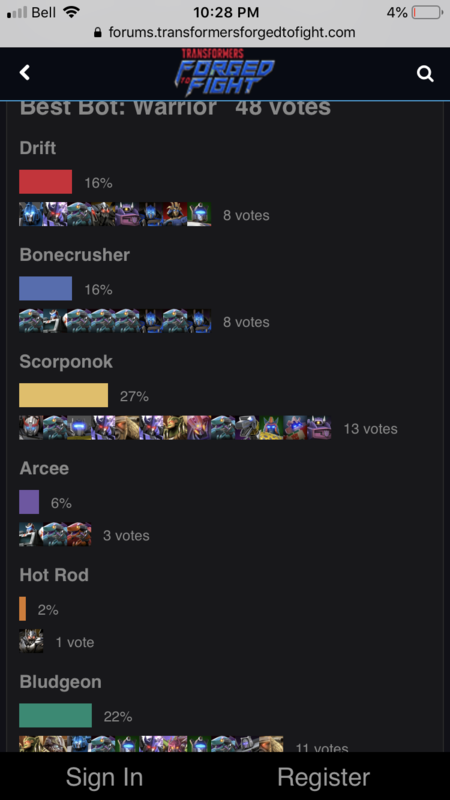 Could you please let me know why got rod is even a viable or even a half decent warrior and why would somebody ever want to rank him up? He is ansolutley a viable option. You can apply decelerate at any point, if they are blocking using specials or just by regular range. When duped, his power gain really helps getting back up to that sp2 which, in my opinion is where you want to be. I do wish is deccelerate would last a bit longer and high a higher chance to proc, but hey. 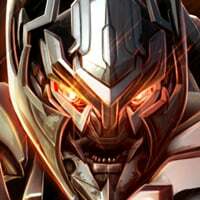 His Deceleration doesn't allow opponents to Evade, making him a great option against evade bots. When duped, he can gain a lot of Power from Acceleration, which can help Hot Rod catch up on that power he used real quick. You cannot go off what one person thinks of a bot. It all comes down to how YOU play and like the bot. Are those other ones better I think so, but again it’s all about your team and how youu want to build it. You could hot rod and mirage for a killer combo. I see, he has crit rate increase as well. Dang it is not easy to decide if I should rank him up or not, I guess I will hold, getting him dupped will also take a much longer time. 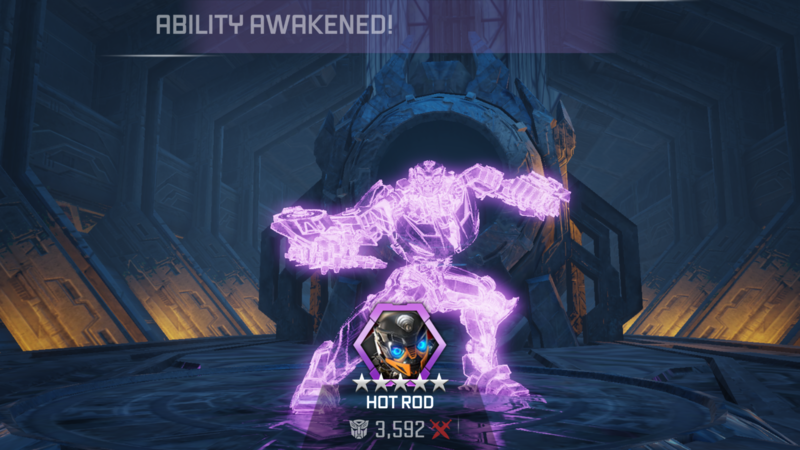 Hot Rod has some nifty combos, but he relies on applying the decelerate debuff from a ranged attack before the melee combo. You should probably try and every melee combo with a heavy attack due to the stun chance on critical hits. By the end of the combo he has 4 crit rate buffs so it's a good chance, especially vs Scouts. Then his sp2 does some mega mega damage if you land decelrate before the full melee combo. I think he procs enough crit buffs that the last hit is always a crit? Waspinator is a pretty good bot. You just have to keep up those Resistance Debuffs with his specials, which is where his damage comes from. Best is to use his SP2 or to rack up as many Resistance Debuffs you can (up to 4) and use his SP3 (the Resistance Debuffs stay throughout the SP3). He does act as a double-edged sword, as he gets better as his health gets lower (increased Ranged, increased Special Attack Damage), but the boosts are worth it. There are better Demo options, but it wouldn't hurt to level him up. 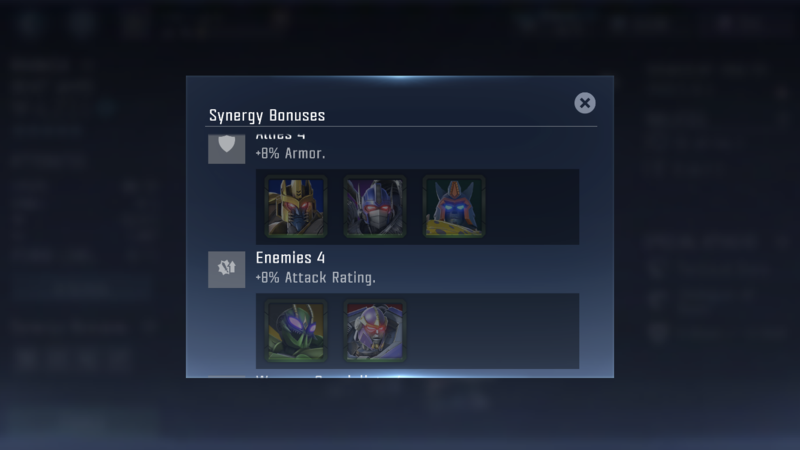 Btw, would you happen to know how big of a difference does synergy make? Final 4* i was missing. Yay me! Well, to me, Beast team is probably one of the best teams. 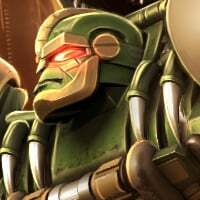 You get the Beast Purification Synergy, which purifies DoT Debuffs, and the bots in it a really great, such as Primal, Rhinox, and Scorponok. However, that's just my opinion, as there are other great teams such as the G1 Megs team, Heralds of Chaos synergy team, there are multiple options. I think it's best for you to test them out and form your own opinion. I hope this helps. @BlackRazak I see, I am planning to do 3* to 4* same bot forging. Before doing that I would save 40 4* crystal. 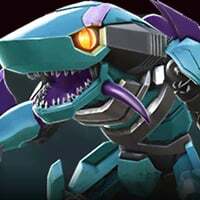 Still trying to get Drift as a 4* (along with G1 Bee). Have Mixmaster as a 5*, so don’t need him as a 4*. Even if those synergies don't seem noticeable to you, it's good to know that every small thing still helps in the long run. Hot Rod (I think) is underrated because his exclusive debuff Deceleration is very important if your fighting a scout or an evasion mod because it prevents bots from evading. Ranged attack induced it won’t last long but it’ll easily get you a combo or two. Sp2 lasts a bit but Hitting the SP3 will prevent them from evading for quite a while. With his dupe he gets even better because his power rate will skyrocket and you can basically do infinite SP1 if you play your cards right or you can unleash a a SP2 or 3 really quickly. 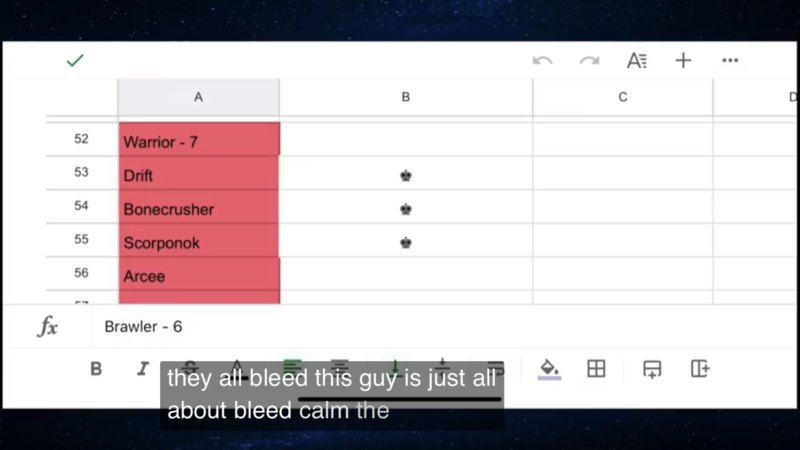 He’s just overlooked because he doesn’t have any bleed attacks like your standard warrior.